Perfect for All Adrenaline Junkies Looking for an Extreme Adventure! Costa Rica has a number of white water rivers that will take you through stunning forests and allow you the opportunity to spot to an abundance of wildlife! 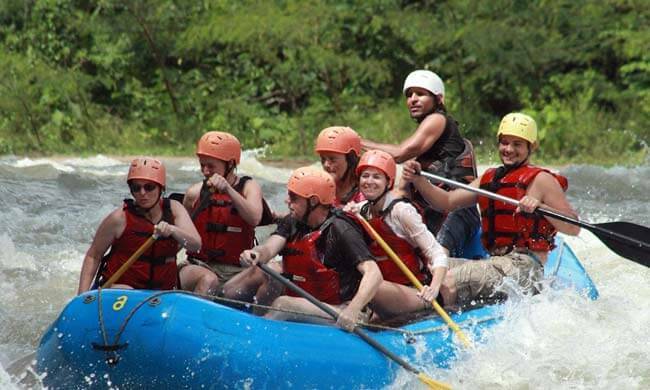 For all you adrenaline junkies looking for an extreme adventure, white water rafting in Manuel Antonio will not disappoint! The Savegre River is one of the cleanest and most beautiful rivers in Costa Rica, offering class II-III rapids right in the heart of the rainforest. Your adventure begins when you are picked up from your Costa Rica hotel and driven a scenic two-hour drive, passing palm tree plantations, farms, and waterfalls and spotting monkeys and toucans along the way. This is a beautiful drive with many photo opportunities along the way! Stop for Costa Rican coffee and breakfast along the way before you reach the loading dock. Enjoy 13 miles of twisting and turning river rapids for three hours, with a break along the way to take in the stunning wildlife and waterfalls! There is an array of wildlife along the Savegre river banks such as egrets, osprey, toucans, parrots, kingfishers, cormorants, and many other species native to a primary tropical rainforest. Wind your way along Savegre until you reach the little village of “Silencio.” There, a delicious Costa Rican-style hot lunch awaits you in a beautiful rustic palapa restaurant up in the hills with an amazing view of the palm plantations. After lunch, head back to your hotel, just a 30-minute drive away. Tour includes: Transportation, breakfast and lunch, bilingual guides, snacks, drinks. What to bring: Water sandals or water shoes, swimsuit, sunscreen, insect repellent, towel, t-shirt, hat. *Please note: stated tour price is for Manuel Antonio area. Tour is available at an additional cost from Jaco and Dominical area. Inquire for more details.